All New Fire Clutch from Hilliard Racing. The FIRE has a bonded high performance friction lining that makes a smooth transition from the slip you need for optimal acceleration off the corners. The clutch includes a special oil & grease shield to keep contamination off of the shoe surface. Brand new heat treated sprocket to accept the needle bearing. The needle bearing helps the kart roll easier through the corners and a better release of the clutch entering the corner. All of these upgrades improve acceleration off the corner and reduce the push through the corners. Upgraded the inner race with a material change and heat treatment so you can get optimal performance and long life. Clutches will come standard with the mounting hardware and correct spacers to quickly mount to your LO206. 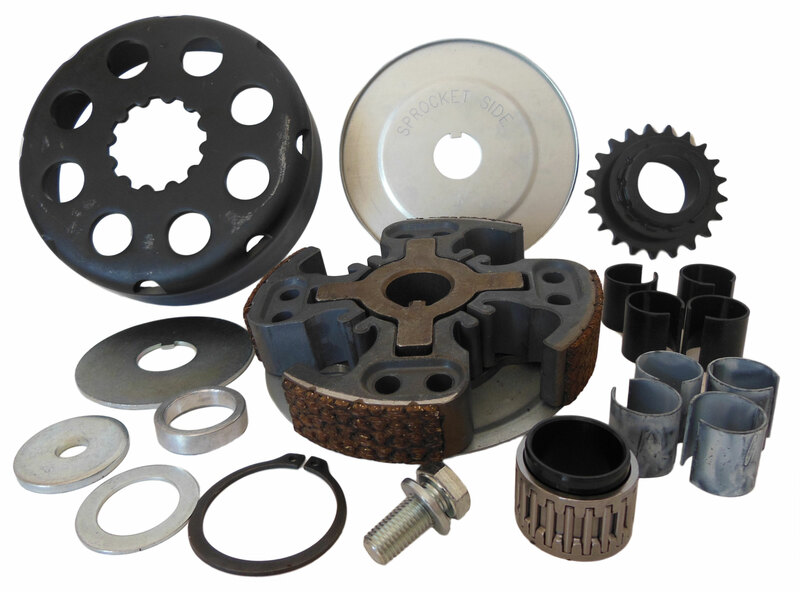 The hardened race and spacers that come with the clutch will clamp the clutch tight to the crankshaft to minimize fretting. The high performance friction lining is cleaned with brake cleaner so maintenance is a breeze. Implements shoes with removable weights to fine tune track performance. Optional weight and spring combinations offer infinite tuning possibilities.